In a pan add the olive oil heat and sweat the onion, celery and leek until soft. Stir in the parsnips, bay leaves, milk, water, KNORR Professional Vegetable Jelly Bouillon then bring to the boil and gently simmer until the vegetables are soft. Blend the soup until smooth, season and keep hot. Blanch the parsley in boiling salted water for 30 seconds, then refresh in ice wate. Bring the cream to the boil and squeeze out the parsley then add the cream and blend until smooth. Once the parsley cream has cooled fold the parsley purée through the whipped cream. Season and chill. 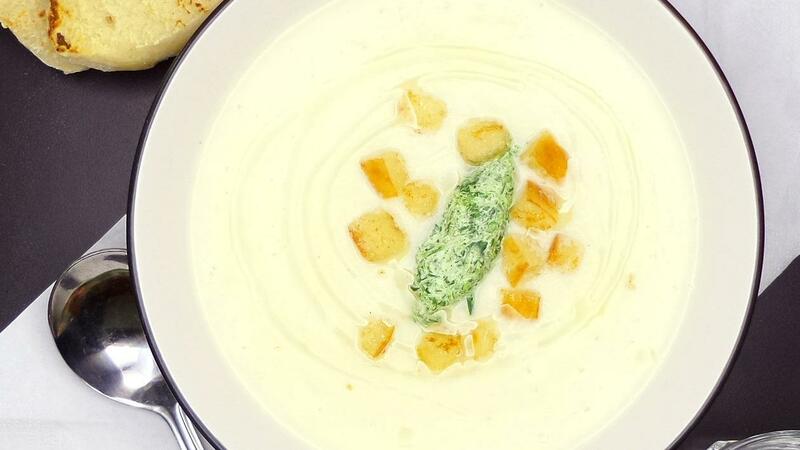 Place the soup into bowls adding a little parsley cream to the bowl along with Croutons.